Editor and screenwriter Andrew Oye helps writers slice and dice material and deliver the concise presentation busy agents, managers, studio executives, TV and film producers prefer in polished scripts and screenplays. Oye’s three-step approach takes a razor to the page to achieve writing finesse by cutting excess. Classify the clutter. Is it: 1) bulky scene/action description and/or 2) chunky/clunky dialogue? Cut the excess. Remove or rearrange language that could be deemed overwrought or unnecessary. Compare the savings. Constantly strive to reduce the number of lines and pages consumed. WANT TO MAKE THE CUT? For consideration, submit one SINGLE page of your script that has a density issue (as a .pdf or formatted Word document) to hollywoodinkrazor@gmail.com. Andrew Oye will share techniques to express content in less space with the same meaning. 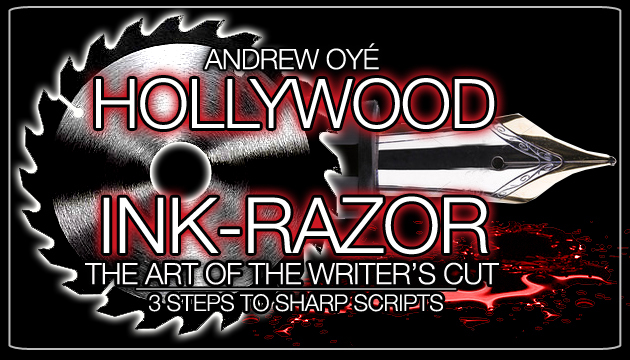 Note: By submitting your script page, you acknowledge and accept that it may be selected, edited and posted as part of the Hollywood Ink-Razor column. You also understand that editing notes represent suggestions not rules. Andrew Oye earned a Master’s in Communications from Stanford University and a Bachelor’s in Human and Organizational Development from Vanderbilt University. A copyeditor and proofreader for many years, Oye has also worked as a sports and entertainment public relations account executive. A novelist, journalist, TV / film screenwriter and director, Oye is the founder of MUSCLE INK™ Media, Sports & Entertainment and media company in Hollywood.